Royal Canadian Mint is one of the most respected mints in the world producing some of the most beautiful and valuable coins that are in high demand among gold bullion investors and coin collectors, including Canadian Gold Maple Leaf coins. Canadian gold bullion Maple Leaf coins derive their value exclusively from the physical gold content and their prices fluctuate according to the market price of gold on a certain day. 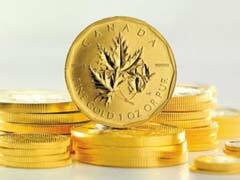 If you would like to know how much a Gold Maple Leaf coin is worth, you need to make a simple calculation and multiply the actual coin’s gold weight by the current spot price of gold. Gold Maple Leaf coins are minted in several sizes ranging from small 1/20 of an ounce coins to standard and most popular 1 oz size. In addition, you need to keep in mind that gold Maple Leaf price also includes not only the gold content value but costs associated with mintage, distribution of the coins and dealer mark ups. Knowing how much a Gold Maple Leaf coin should be worth, you can compare several online bullion dealers and find the lowest price online. If you would like to save some money on dealer premium charges and get the most of Canadian gold coins value, it’s worth buying gold bullion coins in bulk. Many gold bullion dealers like Blanchard online offer special wholesale pricing on Gold Maple Leaf coin purchases if you meet a minimum of 26 ounces of gold. It might be not be affordable for an average investor, but a wider scale investor could greatly benefit from the special bulk pricing. You can buy Gold Maple Leaf coins with confidence in their absolute impeccable quality, high liquidity and superior gold value making them stand out among other popular gold bullion choices.